In this painting, Diana can only be recognised by the crescent moon she is wearing in her hair and by the hunting dog that is sitting next to her. 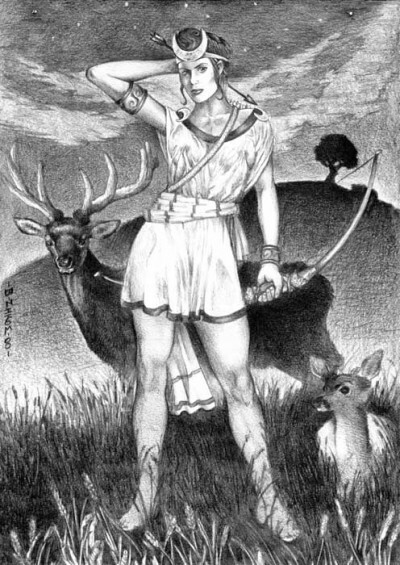 Because of her characteristics as a goddess, she has also been identified with Artemis (goddess of the hunt, wild animals, wilderness and virginity; and she brought and relieved disease in women). As it can be seen in the picture below, both of them carry bows and arrows representing their nature as female hunters. As for the nymphs, two of them are simply resting on the rock and another one is cleaning Diana’s feet using a brass water basin. This water basin has Christian undertones, since it may be suggesting that Diana is cleaning herself both physically and spiritually; even if some critics have also argued that it may be symbolising death. In addition, there is a fourth nymph who keeps herself apart and contemplates the scene from a certain distance, as if she were trying to hide something. She is Callisto, and what she is hiding is her own pregnancy, indeed. The problem is that when Diana chose her nymphs, she made them all take the vow of chastity. Obviously, Callisto broke it when she became pregnant. Diana is not aware of this issue in the scene, but the legend says that when she found out about Callisto’s pregnancy, Diana turned Callisto into a bear and expelled her from the court because she felt betrayed. Therefore, this is the reason why Callisto is dressed in black, and her dressing clearly contrasts the brightness on the foreground – which is emphasised by the women’s bright dresses – with the darkness on the background. As it can be noticed, there is nothing one can see on the background of the painting apart from a tree and absolute darkness. 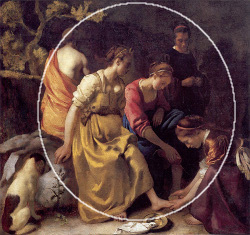 Apart from that, it can be observed that Diana is placed in the middle of a circle created by the nymphs. The circularity of the painting is then conveying the idea of unity, balance and repose, at the same time that it suggests that the relationship between the goddess and her nymphs is quite close and comfortable. However, Diana has never been described as a relaxed goddess, but as the opposite. She is characterised by her bad temper and this is made evident in the moment when Actaeon breaks in. This is the true Diana, and not the one portrayed in this particular scene. She could have imagined that a masculine figure is ab out to appear though, since there is a thistle between her and the dog. This plant is the first that blooms in spring, and it also a symbol of masculinity. However, everything points at the fact that the goddess was not aware of this little detail, since her reaction may have been different if she knew that a man was going to interrupt her sacred moment. Unfortunately for him, Diana has also human characteristics, and this put an end to the hunter’s life.